Who knew? 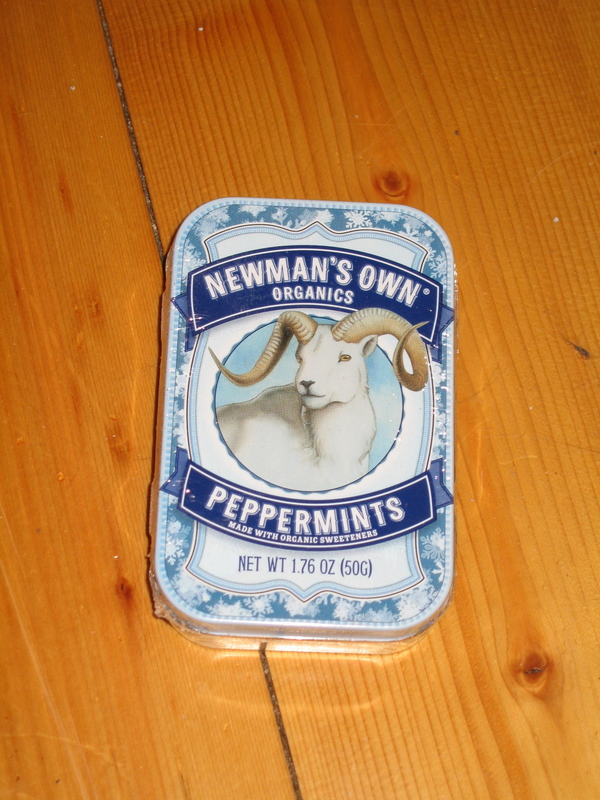 Newman’s Own Organics also makes organic mints! They come in Cinnamon, Ginger, Peppermint and Wintergreen. I haven’t yet tried any of these mints but have the cinnamon stashed in my purse and am planning to take the ginger on my upcoming trip to Florida- ginger is great for upset tummies and to aid in digestion. If you’d like your own chance to try Newman’s Own Organics Peppermint mints then please leave a comment telling me about what your holiday plans are — if you don’t celebrate a holiday leave a comment telling me your favorite winter activity. Please leave your comment by 8pm December 9, 2009. Sorry this giveaway is only open to US residence. I would like to try the mints. My Holiday plans are to spend the break with my wife/delightful daughter and son-in-law. I plan to have one family gathering on the December 19th and then a quiet Christmas at home with my family and my mother. My favorite part of the holidays is having a nice meal with our family, which typically lasts over two hours, then playing games. It may be a bit harder this year, though, with an eight month old grandson. The kids are going to be away this holiday. I’m not sure what Matt and I will do. I’m hoping after Christmas to take them to the Seattle Zoo for a weekend. A special holiday get away. I would love to try these! I was a big Altoids fan until I found out they have gelatin in them. GAH! Our plans are the same every year… my husband’s family on Christmas Eve. Our house Christmas morning. My sister’s house Christmas afternoon/evening. Oh my gosh, Newman’s Own Ginger Mints are so incredibly addicting! I even purchased a box from Amazon, that’s how much I adore these little guys!